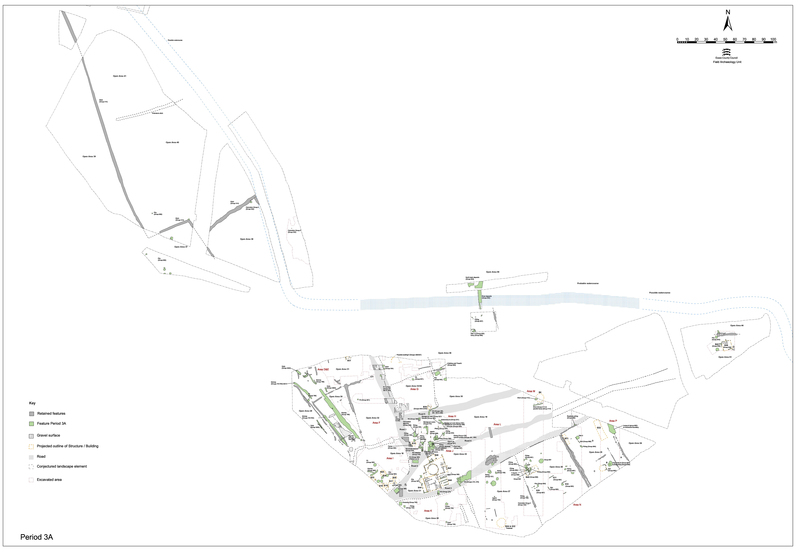 Although the imposition of the new routeway through the western part of the Northern Zone replaces a number of the earlier boundaries defining the area, its overall layout is not significantly changed or disrupted. All the enclosures established in Period 2B, that is Open Areas 29-32, are assumed to endure. However, the encroachment upon OA30 is noted. The creation of the new NNW-SSE routeway does not encroach upon the interior of OA29 (Figure 100). Building 15, as intimated by the way in which the southern terminus of ditch 25028 respects its location, continues to occupy the southernmost end of OA29, at least into the early part of Period 3. 9218 (Group 768), a near-circular pit of 1.9m diameter and 0.38m depth, possibly represents the earliest Roman activity in this part of the Northern Zone. Its small size and circularity set it apart from Period 2 Late Iron Age pits as much as from those of the late 1st century AD onwards in this vicinity. It contains a far greater volume and range of pottery (KPG16, c. AD 55-65) than any other mid-1st century feature in this area. Its location alongside the terminal of ditch 25018 may be significant. Gully 25009 (Group 3063) is 13m long and poorly dated but probably occupies OA29 early in Period 3. It runs parallel with ditch 25028, terminating at the same northward extent. Whether this constitutes the foundation of a sub-enclosure, such as an animal pen, alongside the routeway is uncertain. 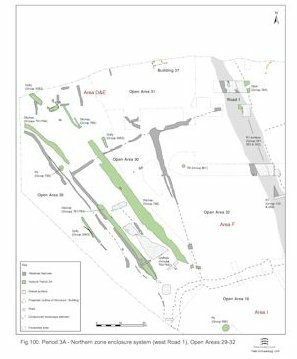 No other early Roman features are identified to occupy the OA29 interior and its use as a field or paddock may be reasonably assumed; although it must be borne in mind that only its eastern part is exposed. 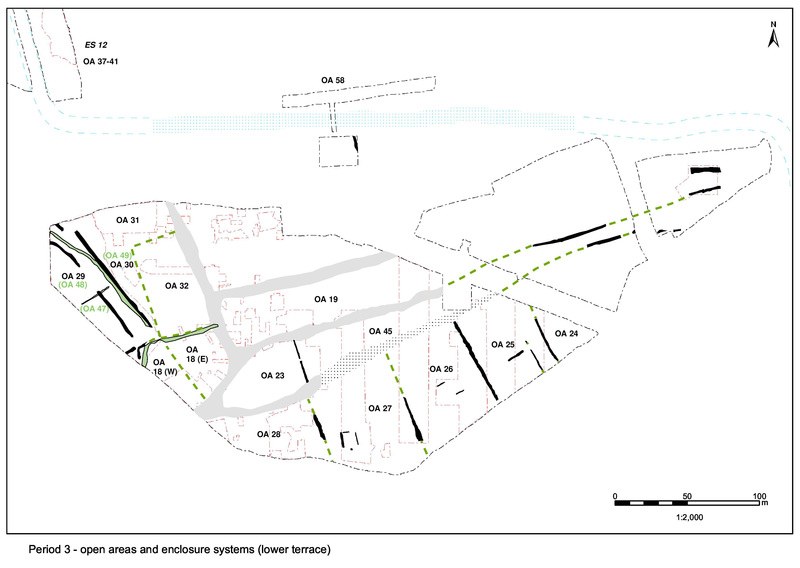 As the western boundary of OA30 is subsequently used as the basis for the western boundary of the Period 3A trackway, it is clear that this already narrow enclosure is significantly encroached upon and its northern boundary rendered defunct (Figure 100). It is uncertain whether or not it survives as a distinct land entity beyond this encroachment, adopting instead the new track as its western limit. There appears to be no contemporary occupying remains within the revised confines of OA30. 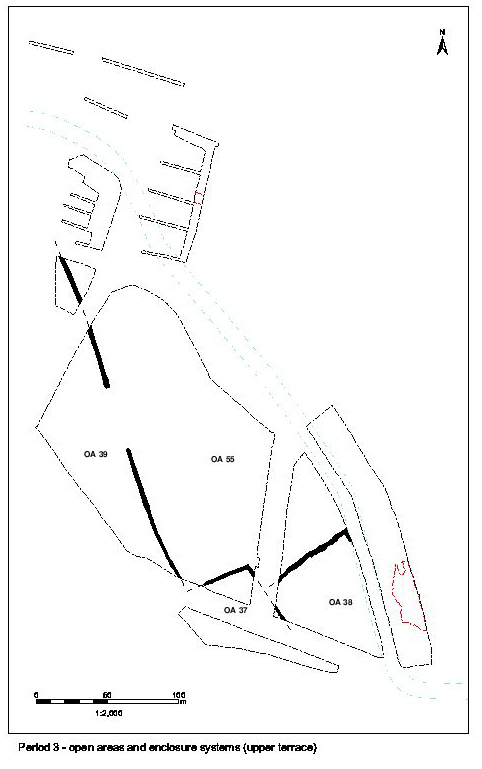 It is assumed that OA31 endures as a distinct land entity into Period 3, although the extent to which it is distinguished from OA30 following the demise of boundary ditch 25016 is admittedly unclear (Figure 100). Only a small portion of its western interior is lost to the imposition of the new routeway. 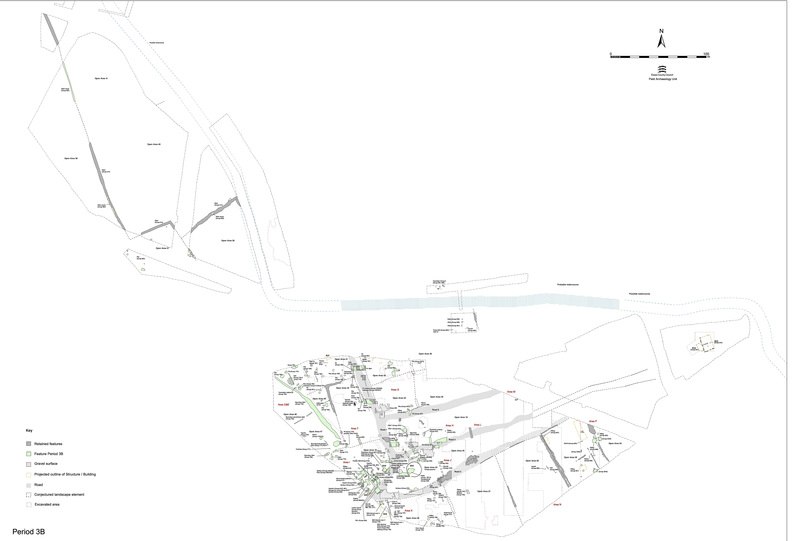 Although no definitively later 1st century AD features have been identified to occupy the interior, a range of broadly dated early Roman pits, gullies and post-holes are present - at least some of which could be contemporary with its Period 3A use. A collection of shallow stake-holes (8109, 8129), post-holes (8064, 8069, 8071, 8075, 8100, 8105, 8117, 8131, 8133) and slots (8082, 8090) form a distinct cluster of structural features located along the north edge of Excavation Area E (Figure 125). 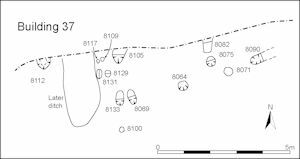 These exhibit a degree of patterning on north-to-south and east-to-west alignments and may collectively constitute the partial remains of a single building - perhaps associated with gully 25037 (Group 785) to its west. Though none of these features produced decent quantities of dating material, either singly or collectively, the pottery and tile spall in slot 8082 at least suggests a Roman date. Open Area 32 is similarly presumed to function into Period 3. 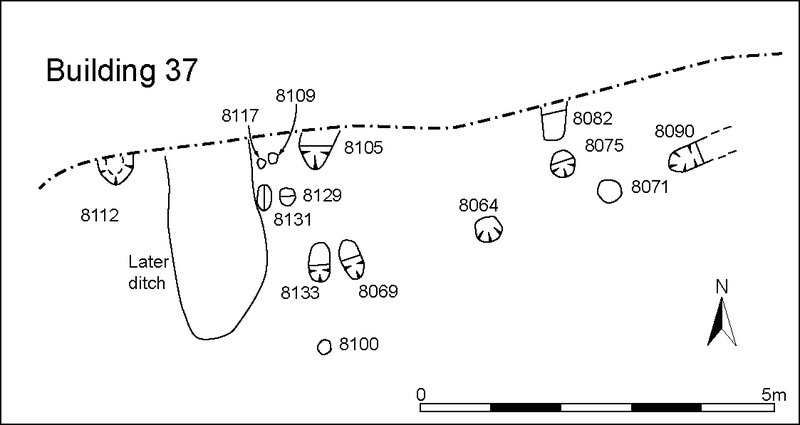 Excavated structural and occupation features are few and far between (Figure 100). 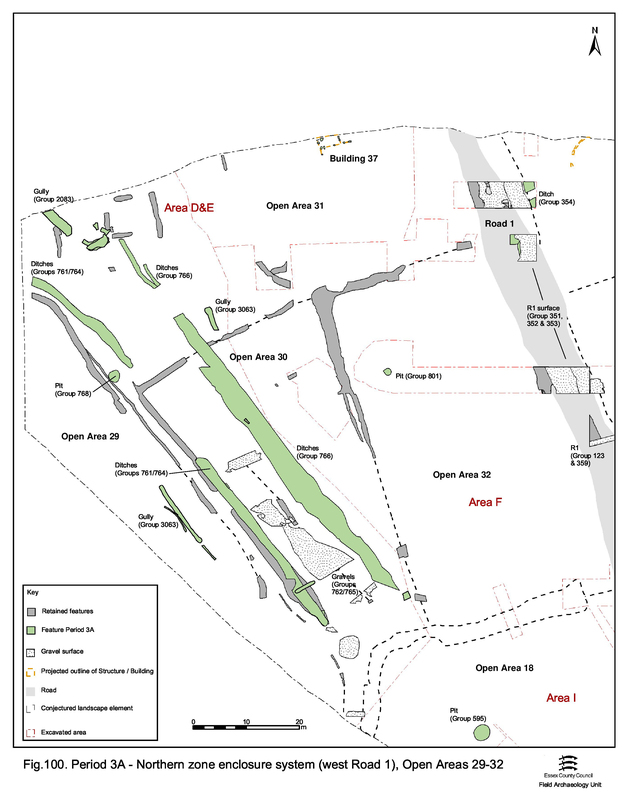 Post-holes are scattered across those parts of OA32 investigated within Excavation Area F, though few can be closely dated. Pit 10355 (Group 801) is a probable early Roman feature, although its recorded stratigraphic relationship would have it cutting Period 4 remains.